Atlas Obscura, the 2016 bestseller, offered rabid travellers and dreamers a new travel bucket list of places off the beaten path. This new Atlas Obscura Explorer's Journal will help them keep track of where their wanderlust takes them, and all their adventures along the way. A lay-flat paperback with storage pocket, this journal features blank pages for travellers to write their itineraries and plans, key contacts, and journal entries about their travels near or far. The journal also includes short guides to twelve of the world's most wondrous cities. Each city guide includes a map with 20-30 obscure locations as well as general travel tips ('How to explore the Parisian catacombs the Obscura Way') Cities include: New York, London, Los Angeles, Paris, Berlin, Tokyo, Budapest, Moscow, Shanghai, Mexico City, Buenos Aires, and Fes. A perfect gift for travellers of all ages, from students planning a big trek to adults plotting local weekend excursions, or anyone who wants to note their travel dreams and wish-lists. 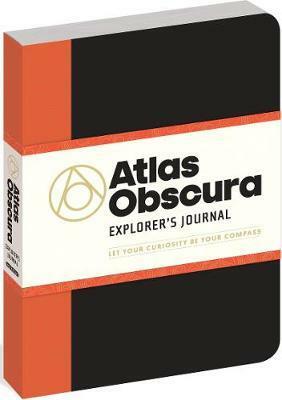 Atlas Obscura is the definitive guide to the world's hidden wonders. Based on the community-driven, editor-curated website atlasobscura.com, Atlas Obscura uncovers unusual and overlooked places not found in your average guidebook. Cofounders Joshua Foer and Dylan Thuras are two of the authors of the # 1 New York Times bestselling book Atlas Obscura: An Explorer's Guide to the World's Hidden Wonders. Dylan Thuras is the cofounder and creative director of Atlas Obscura.